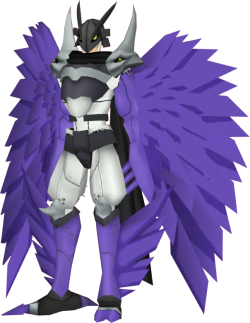 Ravemon (Burst Mode) is a Cyborg Digimon whose name and design are derived from the raven. It is a Ravemon that has temporarily reached the limits of its abilities through Burst Digivolution, and wears all the energy within the atmosphere as an aura. In order to obtain the evolution limit item, you must complete the Partner Burst Mode quest. You can start this quest by talking to BanchouLeomon at Infinite Ice Wall. Shoots a bolt of energy that penetrates the opponent with lightning speed. Makes your wings huge and shoots them at the opponent. This page was last modified on 22 April 2019, at 01:41.